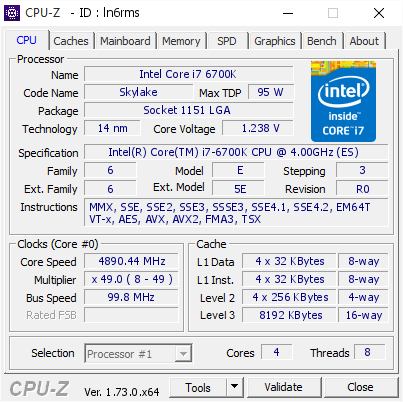 At the time of our Skylake review of both the i7-6700K and the i5-6600K, due to the infancy of the platform and other constraints, we were unable to probe the performance uptake of the processors as they were overclocked. Our overclock testing showed that 4.6 GHz was a reasonable marker for our processors; however fast forward two weeks and that all seems to change as updates are released. With a new motherboard and the same liquid cooler, the same processor that performed 4.6 GHz gave 4.8 GHz with relative ease. In this mini-test, we tested our short-form CPU workload as well as integrated and discrete graphics at several frequencies to see where the real gains are. In the Skylake review we stated that 4.6 GHz still represents a good target for overclockers to aim for, with 4.8 GHz being indicative of a better sample. Both ASUS and MSI have also stated similar prospects in their press guides that accompany our samples, although as with any launch there is some prospect that goes along with the evolution of understanding the platform over time. In this mini-test (performed initially in haste pre-IDF, then extra testing after analysing the IGP data), I called on a pair of motherboards - ASUS's Z170-A and ASRock's Z170 Extreme7+ - to provide a four point scale in our benchmarks. Starting with the 4.2 GHz frequency of the i7-6700K processor, we tested this alongside every 200 MHz jump up to 4.8 GHz in both our shortened CPU testing suite as well as iGPU and GTX 980 gaming. Enough of the babble – time for fewer words and more results! We actually got the CPU to 4.9 GHz, as shown on the right, but it was pretty unstable for even basic tasks. OK, a few more words before results – all of these numbers can be found in our overclocking database Bench alongside the stock results and can be compared to other processors. The dynamics of CPU Turbo modes, both Intel and AMD, can cause concern during environments with a variable threaded workload. There is also an added issue of the motherboard remaining consistent, depending on how the motherboard manufacturer wants to add in their own boosting technologies over the ones that Intel would prefer they used. In order to remain consistent, we implement an OS-level unique high performance mode on all the CPUs we test which should override any motherboard manufacturer performance mode. I believe it is. Ion shift. High voltage = breakdown at some level. Enough damage and things go amiss. When one considers 1.35+ for 22nm high, I wonder why we're doing this (1.35+) at 14nm. If it's OK, then can someone illustrate why one should not go over say 1.6V on the DRAM in 22nm, why stick to 1.35V for 14nm? Might as well use standard previous generation voltages and call it a day? Further, where are the AVX stable loads? Sorry, but no P95 small in place FFTs with AVX = NOT stable enough for me. It's not the temps ( I have an h100i) for sure. For example, on my 4670k, it takes 1.22VCore for 4.6GHz, but 1.27VCore when I stress with AVX loads ( P95 being one of them). To add to the above, downclocking the core on GPU's and running memcheck in OCCT is *it* for my VRAM stability tests when I OC my graphics cards. I wonder how people just 'look' for corruption in benchmarks like firestrike and call their OC's stable. It doesn't work. Run a game and leave it idle for ~ 10 hours and come back. You will find glitches all over the place on your 'stable' OC. Yeah I do all my strenuous testing first, if I have to simulate real world conditions by leaving two tests running simultaneously I do it too... Like running an encode with Prime in the background; or stressing the CPU, GPU, AND I/O simultaneously. AFTER I've done all that THEN I'll restore a pre-tinkering OS image, unless I had already restored one after my last BSOD or crash... Which I'll do sometimes mid-testing if I think I've pushed the OC far enough that anything might be hinky.